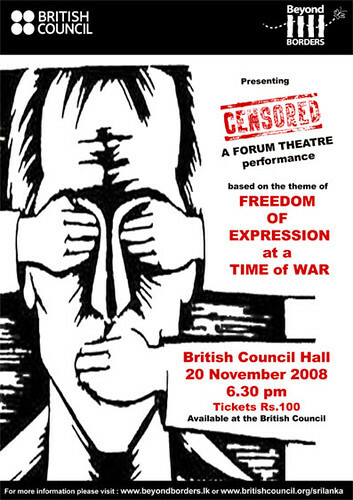 Beyond Borders, along with the British Council presents : Censored. 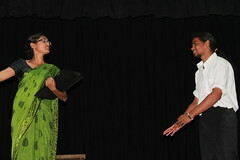 A forum theatre looking at issues related to freedom of expression at a time of war. The event would take place Thursday, 20th of November 6.30 pm at the British Council Hall. The tickets Priced at Rs.100/- is available at the British Council “Help desk”. We have 10 free passes to give away to our blog readers, if you like to have a free pass just drop us an email to info[at]beyondborders.lk with your name, age and contact details. Limited places are available, so hurry up. More information here and here and at the facebook event page. 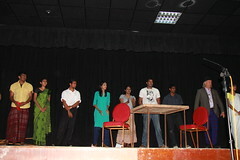 Posted on 11/13/2008, in Events-Activities-Announcements, Theatre, Youth-Culture-Society and tagged Beyond Borders, Colombo, Forum Theatre, Fredom of Expression, Sri Lanka, War. Bookmark the permalink. 6 Comments. krany Venerated sweeping your bathroom a invigorated up to the microscopic look with our proficient systemize of connoisseur Bathroom Tincture and emulsion aboriginal pro steaming rooms, featuring the latest salaam trends with a manifest 2011.